One might assume in this age of technology that computer science is being taught in schools everywhere. However, only one fourth of K-12 schools offer computer science. In addition, African American and female students are missing when it comes to taking Advanced Placement (AP) tests in computer science. 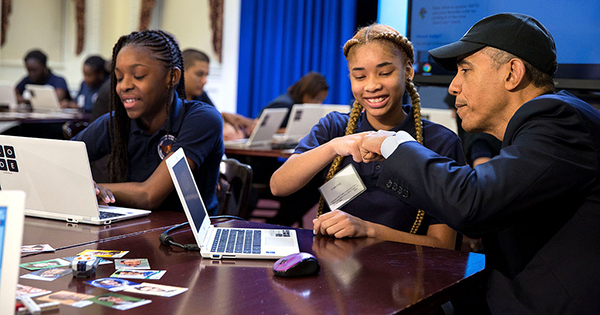 President Barack Obama wants to change that with his new Computer Science for All initiative. A total of $4 billion plus another $100 million is being budgeted to ensure that every student has hands-on computer science and math classes. The $4 billion will be allocated to states during the next three years. States that will be eligible to receive funding will be required to submit plans describing how they intend to expand computer science access in schools. Districts will be eligible to receive some of the $100 million budget as grants. To be eligible, each district will have to submit their plans to expand computer science offerings for students. In addition to the Computer Science for All program, other federal agencies are stepping forward to help. This includes the National Science Foundation and the Corporation for National and Community Service, who are donating funds specifically for training and supporting computer science teachers. President Obama has made it clear that companies, politicians and philanthropists all need to get involved by investing in computer science training. The computer science training initiative was referred to by Microsoft President Brad Smith as an "economic and social imperative." President Obama agrees, recently stating that "In the new economy, computer science isn’t an optional skill -- it’s a basic skill, right along with the three 'Rs." So, the push is on to increase computer science training in school, and especially among minorities and girls.